HDR (or HDRI) - the Photographic Technique of combining multiple shots of the same scene, taken with different exposures, so that you can bring out the shadow and highlights detail in post-processing. Or just creating cool photos. My software of choice has been Photomatix Pro 3.0 by HDRSoft, but I came across Picturenaut, saw it was a free download and thought I'd give it a go. The above is a HDR, Tone Mapped image, processed by Picturenaut, then edited in Photoshop CS3. It looks good enough to me, there might not be as much detail in it as a Photomatix effort, but I think its great for free software! I'm no expert with Picturenaut - I've been using the default settings, and haven't tried any of the plugins you can add to it, but it is easy to use, and seems a bit faster than Photomatix, although you don't have all the sliders to play with, or the option of Tone Mapping with the Details Enhancer. 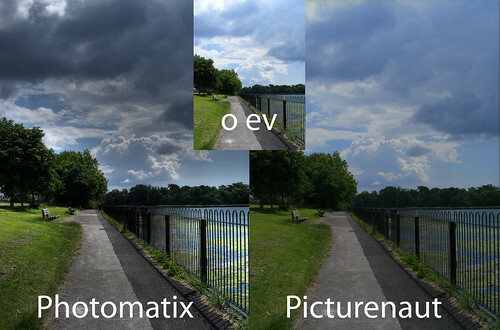 I understand that this version of Picturenaut (2.12) uses Global Tone Mapping, whereas Photomatix uses local Tone Mapping. This means that you're less likely to get those "over processed" images with halo's, alien skies and that "animated" look, which I think is a good thing! You are losing a lot of control though, and you have to put Tripod taken images into Picturenaut, the image-aligning didn't work on any of the handheld HDR's (which Photomatix could align). The following are direct comparisons between images Tone Mapped in Photomatix, Picturenaut, and the original, but please bear in mind that I'm still a beginner with Picturenaut, so didn't play with the options very much, whereas I do know a bit more about Photomatix. The images have not been finished off in Photoshop, so you can see a clear comparison, but I do think that with all HDRi software it's only a step towards the final picture, they almost always need further editing. (If you click on the pictures it will take you to Flickr where you can see the really large versions). I think you get more detail and contrast in the Photomatix shots vs. the Picturenaut - but the Picturenaut images don't look as processed. I think a lot more experimentation is required, but it looks like it's not a case of which one is better, rather they produce complimentary, but different, final images. (Just remember to use a Tripod for Picturenaut!). Get your copy of Picturenaut here. I have to agree with you about Picturenaut looking much better and less processed untill I get to the last image with the clouds. The contrast is needed there so the clouds don't look blurd and dull. 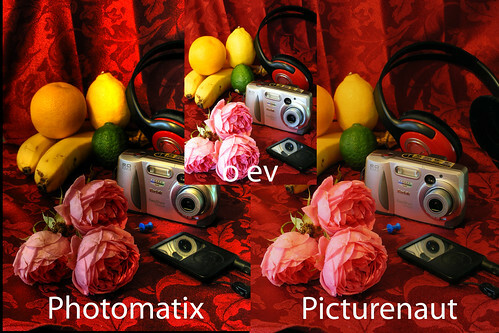 Photomatrix makes it all stand out. I would also like a comparison with photoshop too whould that be possible? Not at the moment, but you can run it in parallels or virtual pc, and I guess boot camp, but I haven't got a mac so haven't tested it. Skipped this the first time around, thought I'd seen waaay too many HDR 'pics', but boy was I wrong. Downloaded Picturenaut, (not expecting much for free), and it was a nice simple piece of kit. Spent a lot of time recently with paint shop trying various methods of contrast masking, dodging and burning, (my old darkroom days came flooding back! 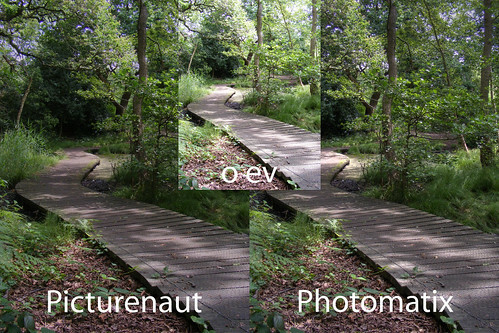 ), with a lot of work required for fairly simple fixes - Picturenaut does this so simply!! No 'nasty' halos, no 'pictoral' effect, no lost or too bright shadows or 'blown' out highlights, just simply what the eye sees and the camera doesn't. The printed finals look great with all the detail showing, people tend to forget images on screen are 'transmissive' like old slides, prints are 'reflective' and look so different. Thanks Rob for the comparison and the pointer to a great piece of software. Victor, thanks for your comments, they echo my thoughts, HDR imaging is at its best when the finished photo can't be "tagged" as a HDR, it should just look like a very well exposed shot. Hmm, think I dismissed HDR too quickly. Recently saw some very good work using 'qtpfsgui', (another free HDR package) and several people using multi-layering techniques with different tonemapping algorithms. Some of the black and white work reminded me of 'split-grade' printing, common in darkroom work. 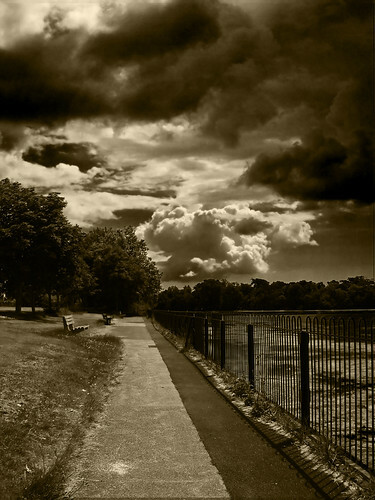 Still think picturenaut is the best for true looking colour prints, but HDR definately has a use for other creativity. How do I get the free Picture HDR software? I was told that I can download if but can't find anything. then click the "download" link on the right hand side of the screen.